Plug the extender directly into an electrical outlet and the VICTONY extender can easily extend Wi-Fi coverage to dead zones which your existing Wi-Fi signal can't reach and increase the signal coverage of your Wi-Fi network for better Wi-Fi quality. Signal Strength LED Indicator - Designed with a signal strength LED which helps you find the best setup location for optimal Wi-Fi coverage. The network name (SSID) of the WLAN access point must be set to "visible". Forwarding of IPv4-based protocols/Address Resolution Protocol. 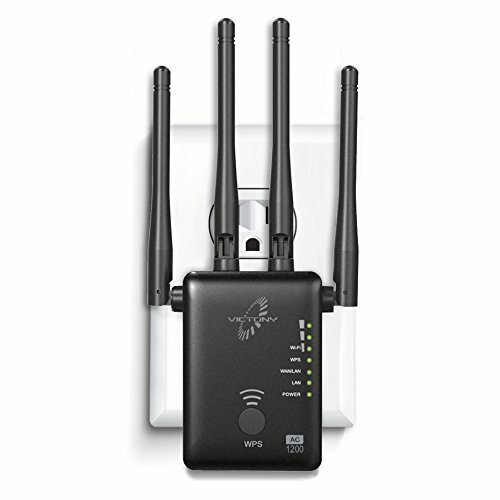 1x Dual Band Wireless WA1200 Range Extender. Supports all 802.11 a/b/g/n/ac standards of Wi-Fi routers and wireless access points; Wireless AC technology delivers combined dual band speeds of up to 1200 Mbps. If you have any questions about this product by VICTONY, contact us by completing and submitting the form below. If you are looking for a specif part number, please include it with your message.